As report lead author Professor Rhiannon Tudor Edwards explains: “Today, one in three children live in poverty in Wales. Those born in the most deprived areas of Wales could expect to live 19 fewer years in good health than those born in the least deprived areas of Wales. Wales is already spending millions of pounds each year on the consequences of a poor start in life for many babies born today. These are acknowledged facts, and their consequences are costing the economy and society dearly. Source: Current spending based on figures by the Office for Budget Responsibility (2015)This report highlights evidence that the foundations for thriving are laid down long before birth, with a critical time for investment occurring pre-conception and in early pregnancy. The report draws on evidence that shows that every £1 spent on contraceptive services could return between £11 and £14 in savings to the NHS in Wales, in addition universal provision of essential vitamins during early pregnancy is highly likely to be cost-effective. The additional cost to Welsh NHS maternity services of delivering low birth weight babies attributed to smoking and other modifiable risk factors is estimated to be £2.15 million annually. It also estimates that increasing the proportion of women who exclusively breastfeed at 4 months (currently at 9% in Wales) to that seen at birth (57% in Wales) could save the NHS in Wales £1.5 million annually in treating common early childhood illnesses. Approximately 5% of children in Wales have some form of conduct disorder. Public sector costs for children with conduct disorders are ten times more than for children with no conduct disorders. The reports highlights that parenting programmes, if delivered well, can be effective and cost-effective in preventing and reducing the long-term effect of conduct disorder in children, with potential lifetime savings of around £150,000 per case. The report highlights the wider context for investment in Early Years by considering children’s environments and community. Acknowledging the importance of physical activity and play, the report highlights that every £1 invested in adventure playgrounds could provide a return on investment of £1.32.Playgrounds and public spaces should be appropriately valued as health and well-being creating assets and a means of tackling social exclusion. 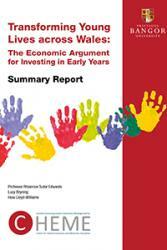 The authors concluded that based on international evidence including strong evidence of effectiveness for early intervention programmes from Wales, investment that focuses on the critical window of the first few years of life is likely to provide the most efficient use of public resources, yielding returns over and above other forms of financial investment and investment at other points of the life course.